Submitted photo Members of the Miami Valley Dance Center competed in the Masquerade National Dance Competition in late April. 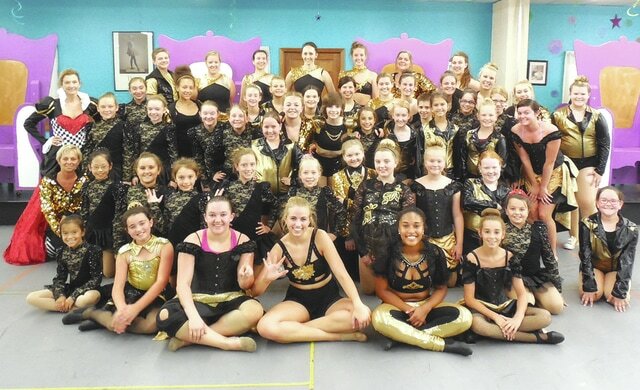 FAIRBORN – The Miami Valley Dance Center’s (MVDC) Dance Force was back at the Dayton Convention Center for the Masquerade National Dance Competition April 24-26. MVDC’s Sapphire Jazz took home a Platinum and third overall junior gold large groups for their performance of “You Really Got Me.” Sapphire Lyrical’s “With a Little Help from My Friends” scored a Platinum, the People’s Choice for Best Lyrical Routine and placed third overall in junior gold small groups. “Weird Science” by Sapphire Elite netted a Platinum and finished fifth overall in junior gold small groups. Diamond Tap’s “Paparazzi” netted a Platinum, a judge’s choice award, the Audience Choice Award for Favorite Tap Routine, and the Industry Dance Award for Tap. “Take Me to Church” by Diamond Lyrical also took home a Platinum while “Whatever Lola Wants” by Diamond Jazz and Diamond Elite’s “Woman’s World” collected High Golds at Masquerade. Julia Stultz’s “Box of Secrets” grabbed a judge’s choice award and was the second overall junior gold solo. In the teen and senior tap solos, Grant Shaffer’s “Dancin’ Machine” was the fifth overall high scoring teen gold solo while “I Wanna Dance with Somebody,” by Alexis Minton secured the sixth overall senior purple solo. Rounding out Masquerade, Thaliyah Cools-Lartigue’s hip-hop solo to “The Joker” collected a judge’s choice award. MVDC Directo, Kelly Fuller, said, “We’ve upped our game this year in terms of difficulty and intensity and I was so proud to watch our dancers shine. They really held their own against some tough competition this season.” Fans can follow the Dance Force’s progress and at the MVDC website, www.miamivalleydancecenter.com and on Facebook.